Dahlias originate from Central America, in particular, Mexico. Records indicate that they were first grown in Europe in 1789 at the Royal Gardens in Madrid. 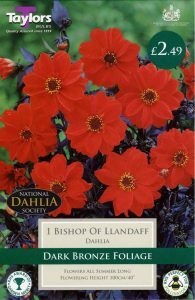 Perhaps the most popular and well known Dahlia is Bishop of Llandaff. In the 1920’s a breeder by the name of Fred Treseder produced seedlings from an unknown crossing. He showed several varieties to his friend who at that time was the Bishop of Llandaff and asked him to pick his favourite so consequently the dark leafed variety he picked was named after him. Since then this variety has been extremely popular due to its dark foliage and resistance to virus. The variety received an RHS Award of Merit over 75 years ago and in 1995 it was further recognised with the RHS Award of Garden Merit rubber stamping it as a garden favourite. 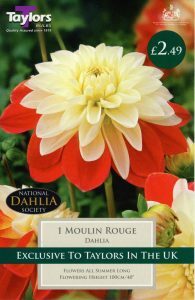 Dahlias are relatively easy to grow. They can be purchased from January onwards and there is a large and diverse selection of varieties to choose from. They are best planted outside after the risk of frost has passed. 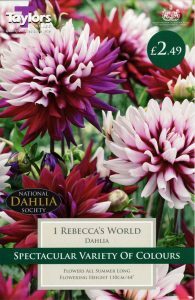 Dahlias prefer a rich soil with good drainage and choose a spot with full sun (remember where they originate from!) although they will tolerate partial shade. If possible, try to work in a good amount of well rotted manure prior to planting. They should be planted approximately 15cm deep and 60cm apart. Dahlias can be started of earlier by planting in containers. Plant in peat and place in a frost free greenhouse then plant out as normal. Slugs and Snails can be particularly partial to Dahlia tubers so it may be wise to take precautions to discourage them such as a dusting of course grit over the soil where your tubers are planted. Other pests that you could encounter are greenfly, blackfly and earwigs but don’t be put off as they are easily controlled. 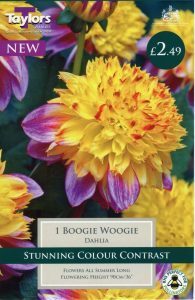 There are plenty of chemical controls available in the garden centre or you could try trapping earwigs using flowerpots stuffed with newspaper inverted on canes and strategically placed around your Dahlia bed. As your Dahlias grow and get taller, they may need support to avoid wind damage; a 1.5m tall wooden stake or similar sized can should suffice. Feed regularly with a high potash feed to encourage flowering. 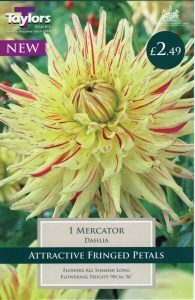 Your Dahlias will start to flower from July right through until the first frosts of the autumn and you can help them with regular deadheading. Once flowering has finished, leave in the ground until frost blackens the foliage then cut the stems to approximately 15cm above ground level and gently lift the tubers from the soil. Clean these off and store upside down for a week to allow any excess moisture to drain off then place in a box of dry peat and store in a frost free place (garage or shed) until you are ready to plant them out again the following spring. In some areas of the country with milder conditions and very well drained soil, it is possible to leave Dahlias in the ground over winter although it would be prudent to cover with mulch; approximately 10cm depth should be sufficient although success cannot be guaranteed especially in hard winters. Dahlias are particularly good for cut flowers and the more you cut them, the more they will flower although they may need extra feeding if you are regularly taking cut flowers from your plants. Varieties that are particularly good for cut flowers are Boom Boom Red and Tam Tam or you could choose the “Dinner-plate” varieties (so called for the size of flower) such as Arthur Hambley, Purple Explosion, AC Dark Horse, Hart’s Dr McMurray, Mom’s Special, and Kiev. There are several dark leafed varieties that are particularly stunning due to the contrast they provide from their dark bronze foilage and these are a welcome addition to any border. Look out for varieties such as David Howard, Twyning’s After Eight, Purple City and not forgetting the aforementioned Bishop of Llandaff which is a classic border variety. There are varieties such as Braveheart, Sunshine, Pretty Woman that are suitable for growing in pots. These will reward you with a summer long display of colour; even better if planted with summer bedding. If you choose to plant in containers, take care to ensure that you establish good drainage as Dahlias will rot if they are sat in water for too long.